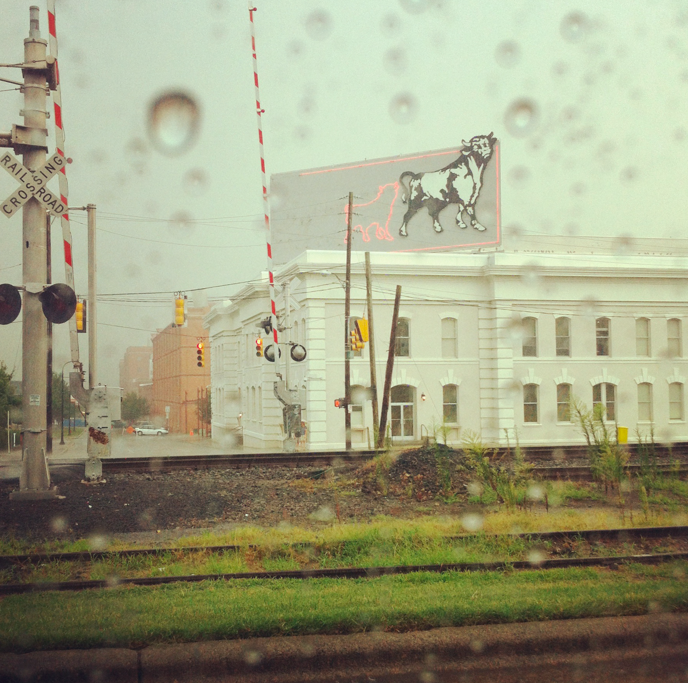 Last week my husband and I went to North Carolina for a quick trip and we spent a lot of time in Durham. We’ve been there a number of times together, and my husband knows it very well after being there for three years in law school. It’s changed a lot…he tells me (because I didn’t know him in law school, I’ll have to take his word for this). On our first evening after dinner we spent a lot of time driving around both the more vibrant and revitalized area of the city, as well as the, well, not so revitalized part (of course, we were headed to an auto parts store to find some obscure air filter for our a/c). 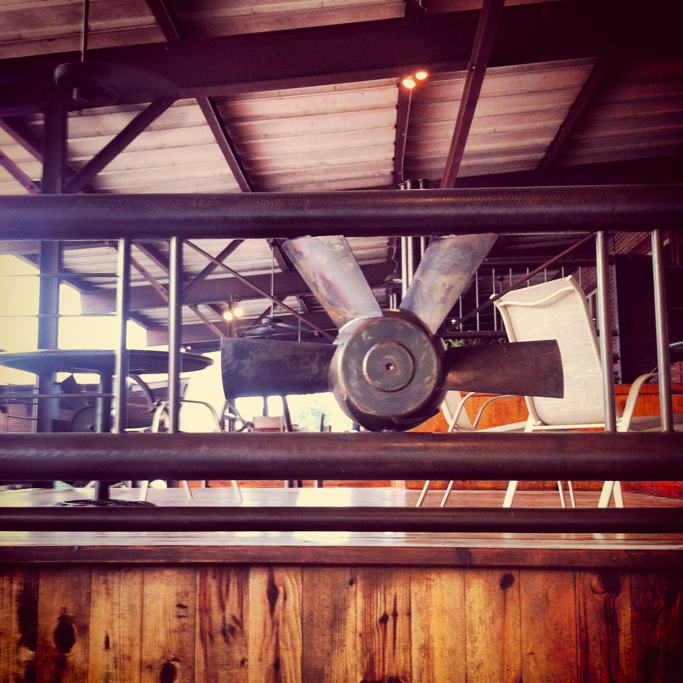 I ended up downloading Instagram for my iPhone that evening, and I got some really fun pictures. In fact, I didn’t take any photos of people on our trip, just a few places. I love the way these turned out. Here are some of the photos I took that I really like. I downloaded Instagram in the parking lot of this store we love visiting while in Durham; it’s called Parker and Otis, and if you know me and have been there, you know that I love it mostly for its selection of candy. 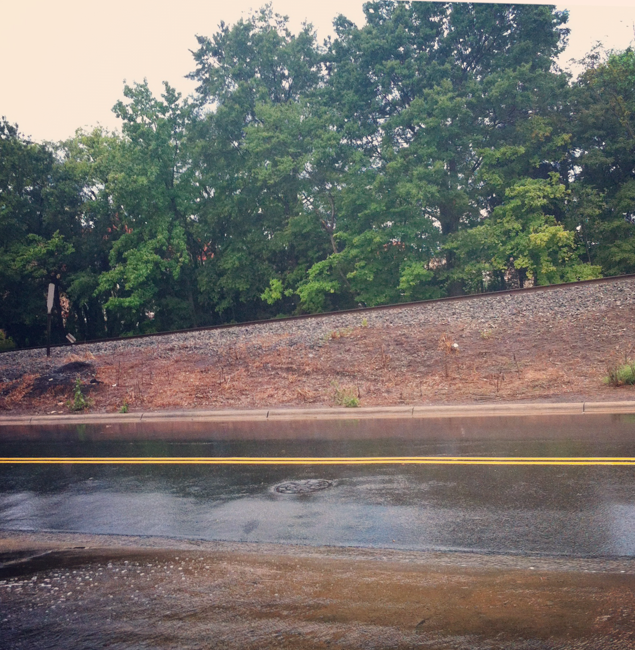 This is in that parking lot right at the end of a huge rainstorm; luckily, we were under a covered roof. The porch at this store has a ton of reclaimed/industrial materials. This is the case with a lot of downtown venues, as the area was once chock-full of tobacco warehouses and southern industry. Now, it’s just mostly southern charm and re-furbished lofts. Here’s the porch: I have to assume this was a fan. I took this at another traffic light. The restaurant isn’t necessarily somewhere I’d want to eat – oxtails, anyone? 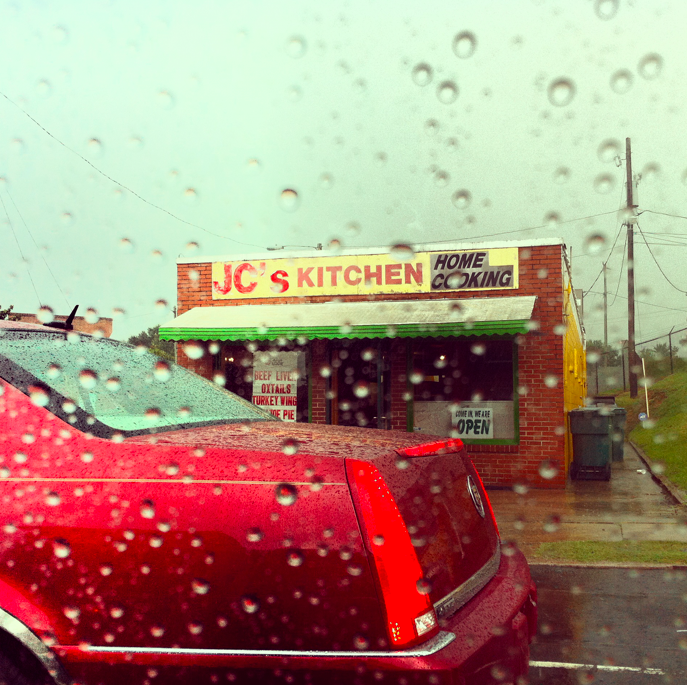 – but the moment the red Cadillac pulled up I wanted to take a picture. Great color! 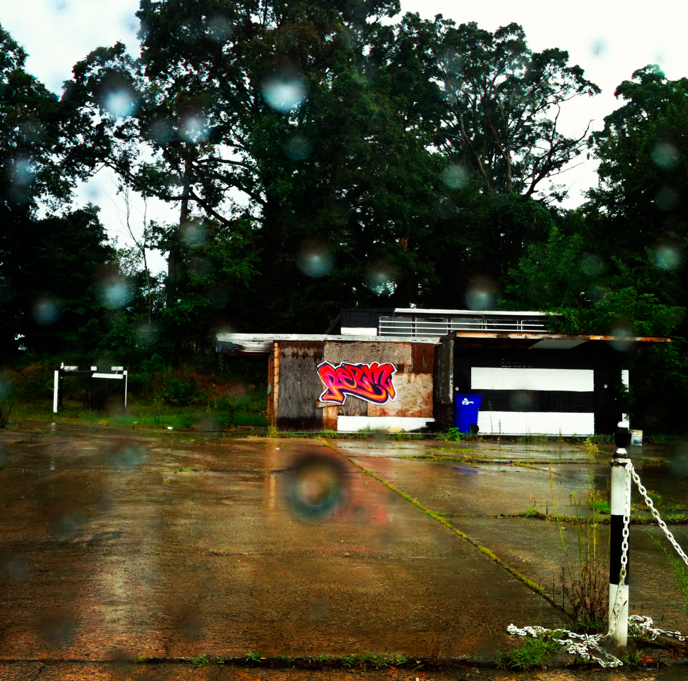 I may have made my husband circle back to capture this rundown building. The graffiti! The horizontal graphic black and white stripes! I really like it, purely in terms of gritty aesthetic. 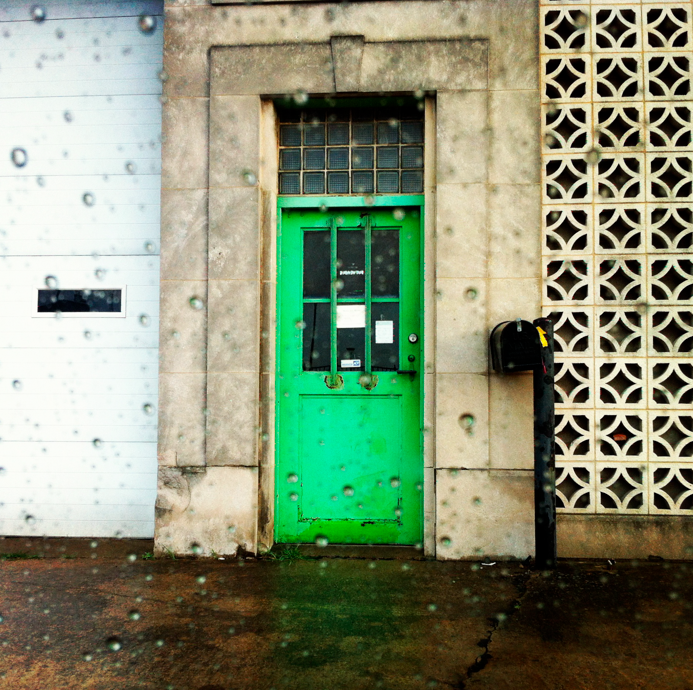 What a cool green door. There were two of them. So neat. This was actually taken on another day, but it’s a food truck that sells ice cream. On a school bus. My son would be in heaven. My limited understanding of the food truck culture in the Triangle is that they’re fairly new, people like them, and they’re still struggling with how to regulate them. Durham clearly has the most friendly food truck climate of Raleigh/Durham/Chapel Hill, and given my numerous encounters with black-framed glasses and waxed mustaches during our time there, it has the biggest hipster culture as well. In fact, lots of food “trucks” are actually bike carts. 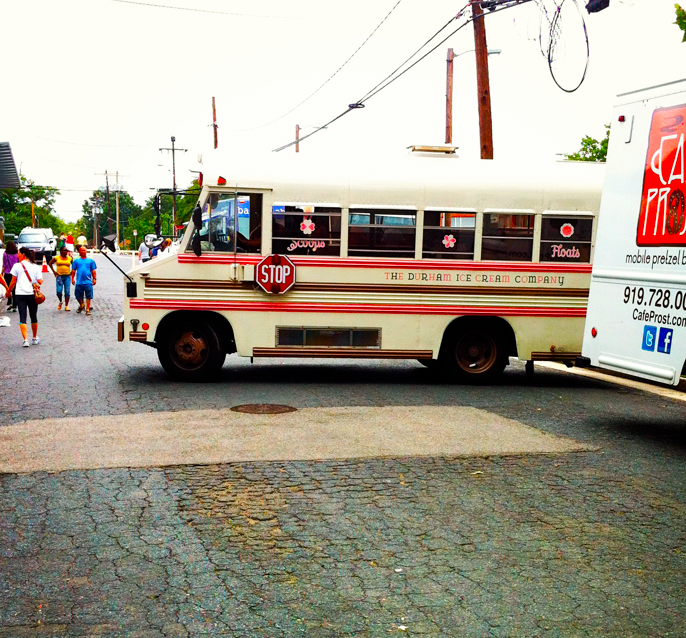 We went to the Saturday morning farmer’s market and it, too, was a food truck gathering spot. And finally, this is entirely irrelevant to the vintage/gritty vibe I’ve been harping on here, but DID YOU KNOW THAT IN THE SOUTH THEY HAVE A SNACK WAGON FOR KIDS AT WHOLE FOODS WITH FREE SNACKS? I almost passed out. 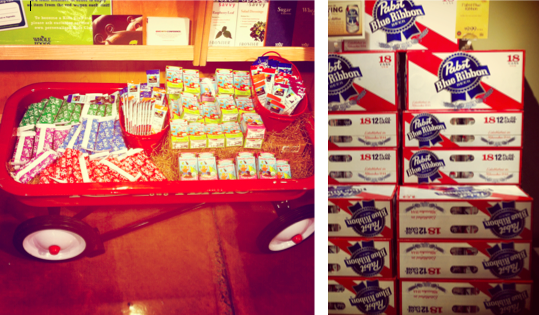 They also have towers of PBR…in Whole Foods. Hope you enjoyed my very limited photo tour as much as I enjoyed capturing it all! I wish I’d taken more pictures!